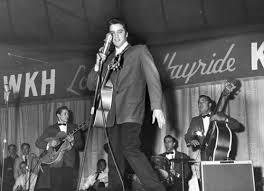 On October 16, 1954, at the age of 19, Elvis appeared for the first time on the Louisiana Hayride, a live, Saturday night country music radio show originating in Shreveport. It has been credited as being the vehicle largely responsible for giving Elvis his start. 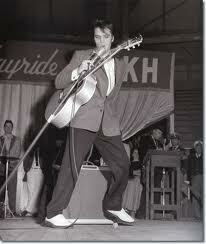 As his popularity grew and Hollywood beckoned, Elvis' performance schedule at the Hayride diminished. It was during his last Shreveport performance on Dec. 15, 1956, at the Hirsch Coliseum, that the phrase "Elvis has left the building" was first uttered, and the rest, as it is said, "is history." Elvis Presley was added posthumously to the Shreveport Walk of Stars in 2001.